The holidays aren't for everyone! Is the holiday season a difficult time for you? Maybe you have memories, losses or hurts that you associate with this time of year. Or, perhaps, you simply struggle to keep up with the happy go joyful attitudes of your family, friends, neighbors and radio dj’s that believe playing 25 straight days of Christmas music cures all things. You, my dear friend, are not alone. I can’t pinpoint the time of my fall from holiday cheer, but I know I was a young teenager. It came one year at Thanksgiving when I was shunned for not complying with the request of my abuser. Since I said no, I was ignored for weeks, months, whatever it was; but all I can remember was- it was Thanksgiving and straight on to Christmas. I remember sitting around our table and being so sick to my stomach that I literally had to excuse myself to go vomit. This was nothing new, the ‘ignore Lisa when she doesn’t give me what I want trick’. It was part of my life. For some reason, that particular time stuck, and it impacted me, so far, for the rest of my life. 'No' meant I lived, I was left alone, but I wasn’t visible or worth anything, and oh how that man made it seem like I was the biggest shadow of nonexistence ever! Fast forward to today…. Despite my past, how can I stimulate the constant frown, wake up the joy and stir the laughter that I know, that I believe, is deep down within? Will I ever find myself just excited about for this beautiful season of good cheer? I may never fully be like Ms. Susie must sing every Christmas song ever recorded, but I do believe I can walk a path that leads to something better than where I find myself today. Volunteer- when we give back, we take the focus from ourselves to the well being of others. I don’t care who you are, helping others is just good for the soul! Relax- don’t feel obligated to attend every party, send every card, and perfectly wrap a million gifts. Shopping and material gifts often overwhelm the true meaning of Christmas for us Christians. We are beginning a season of focus on the birth, life, death and resurrection of Jesus Christ. Keep focused on all He did for you rather than all you can buy for ‘them’. Relax and reflect on Jesus! Traditions- if you are held back due to past holiday memories, start new traditions. Make new memories and fulfill those past wishes with exciting ways to celebrate today. Suggestion- throw a Happy Birthday to Jesus party rather than a “Christmas” party- make it light and fun. Keep all things pointed toward the birth of your Savior, and see how fulfilled you feel on the inside. Help- if you are down, ask for help. This can often be the most depressing time of year. Take notice of your mental health and take control. Seek counseling, get in touch with the friend that truly listens, reach out to your pastoral team, but reach. You never have to go through these times alone, I promise, help is there. 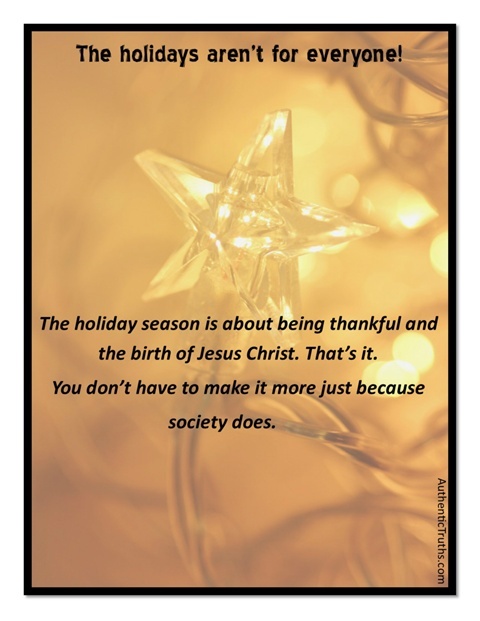 The holiday season is about being thankful and the birth of Jesus Christ. That’s it. You don’t have to make it more just because society does. Be thankful for Jesus- he loves you, he wants to be part of your life- the happy, sad, or mad. He left you many wonderful words of love, read His word! The best way to be excited is to be excited for Jesus and to share it with others. Even as I write these few ideas down, I know it isn’t always as easy as this. Sometimes, we will stay in this realm until the season has come and gone. Just know you are not alone, you are valuable to this world in so many ways. You have so much to look forward to and so much to offer! Hang on and start small. Each small step you take leads you through the season and right on out, hopefully better than when you started!